I once worked with a woman who could not bare to eat bananas with any sign of bruising – in my opinion she was eating bananas that were so green they were practically crunchy. Clearly what she needed was a banana protector. Yes, really. 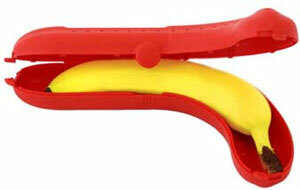 The Swedish designed Banana Protector may look a little…interesting, but it will keep your banana bruise free. 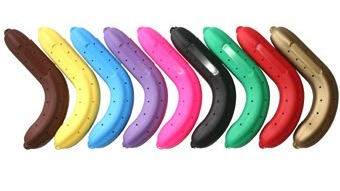 It is shaped to fit bananas of all shapes and sizes, is made from recyclable food-safe plastic and is dishwasher safe – what more can you ask for in a banana protector? Available from Baby Goes Retro for $11.95. For an equally odd banana post, check our guide to how to peel a banana. One of our readers, Kylie, asked what we thought of this product. We think it’s a novel idea but would love to know what you think. Please comment below and share your thoughts with us.